On 28th Nov’15, Akshar Bharati helped setting up Library section for Psychiatric Rehabilitation Services centre NIMHANS, Bangalore. Psychiatric Rehabilitation Services provides day-care to person with psychiatric disabilities and engage them with some vocational activities like arts, dance, yoga. Reading would be an additional activity. 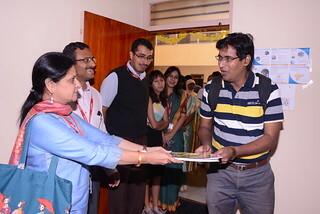 The library was inaugurated by director of NIMHANS Mr. P. Satish Chandra. At Akshar Bharati we generally setup libraries for under-priviledged children at schools or communities where they can read books. Setting up library at NIMHANS certainly does not fall in that category. The idea to setup library there came from our volunteer Renuka Gopinath and she connected us with Doctors at there. Dr. Hareesh was our contact person there. He and his team have done an amazing job to setup the library room, collect the old books and arranging them. One of the Doctor’s daughter talked to her classmates, strangers to collect the books !!! To setup the library we collected old books, magazines in different languages like Hindi, Kannada, English, Malyalam, Telgu, Bengali and Tamil. To spread the word we created flyers, facebook events etc and our Akshar Bharati co-ordinator Mr. Ganesh did all background work for that. Some of our friends also bought new magazines subscription for the library. Collecting books/magazines for this library would be an ongoing process. If anyone wants to donate then feel free to reach out to me. It was great team work and we are happy that we could do it. I am hoping keep this momentum going and setup more libraries in and around Bangalore.